There is an ever-growing trend for outsourcing SEO services in the business circles. No one can undermine the fact that optimizing your websites for search engines is a profit earner for businesses from the online sales it could potentially generate. 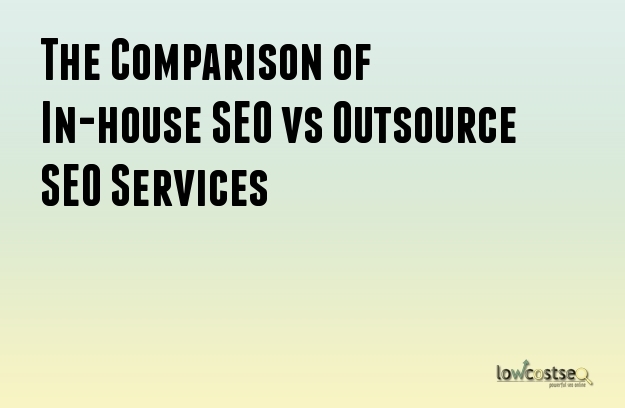 But is outsourcing the SEO work a trend or for practicality purposes? What is the best way to judge the practicality? It is to weigh the SEO costs. As a business owner, your business acumen will surely lead you to evaluate the costs of outsourcing as compared to building an in-house team. So, we thought we would help you by comparing the costs of both options. If your company does not sell high-end IT solutions, building an in-house team is just a waste of time and money. If you endeavor to offer search engine and other Internet marketing services in the future, then you must definitely employ search engine marketing professionals and build an in-house team. There is a feeling among business owners that operating an internal team is a much secure option than having it done by some unknown names sitting miles away. They do not feel comfortable letting outsiders operate their company accounts in fear of security risks. Outsourced vendors may only seek to get the job done, and this may come at the business’s expense. However, most of the abovementioned issues can be circumvented by the prudent selection of a professional SEO company. When you pay the outsourced vendor for their SEO services, you get experienced professionals, tips and suggestions, tools and set up inclusive. This can be a significant cost saving for your company, especially when you do not have to allocate resources to train and manage your in-house team. As the competition is tough in the industry, SEO companies are striving to stay ahead of the pack by offering genuine and extra value to their customers. As such, you can be assured that with this competitive pricing, you will definitely get the desired results at a cheaper cost.